Bernie Ecclestone is the undisputed king of Formula 1. With that there's simply no arguing. Legal battles or not, Ecclestone converted the Formula 1 championship into a multi-million dollar business that has over the years moved from primarily Europe to several countries around the world. Some countries have managed to hold their place on the F1 calendar, like Malaysia. While others, such as Turkey, have dropped off the map. It appears that after the 2013 edition of the F1 race, though, Indian GP might be another one of those races that once were. At least, that's what Big Boss Bernie's comments at the Hungarian Grand Prix seem to indicate. What did Bernie say then? Reportedly Ecclestone, President of Formula One Management, declared that India had to come to a decision as to whether or not it wanted Formula 1, and sort all existing issues out. The issues in question are primarily the taxation issues that the teams currently face. In the past two runnings of the event, teams have faced heavy taxes, something that isn't common to the other races on the F1 calendar. Meanwhile, when we spoke to sources at the Jaypee Group, owners of the Buddh International Circuit (BIC), we were told that there was no official communication from the FIA about the Grand Prix being dropped. "We have a contract to host the Indian Grand Prix till 2015 and as of now that still stands," we were told. However, we were also told that seemingly important meetings were taking place at Hungary, information from which hadn't as yet trickled down to India. "We will not know anything officially until the World Motor Sport Council meeting is held in September, after which the 2014 calendar will be released. As far as we know, there have been no amendments to the contract." Vicky Chandhok, president of the Federation of Motor Sport Clubs of India was also able to throw some light on the situation saying, "The JPSI and Formula One Management are currently relooking the calendar for 2014. The plan is to run a race early in 2015 around the same time as the Australian, Malaysian and Chinese Grands Prix." In such an event hosting a race late in 2014 and a short while after in 2015 will be near impossible. 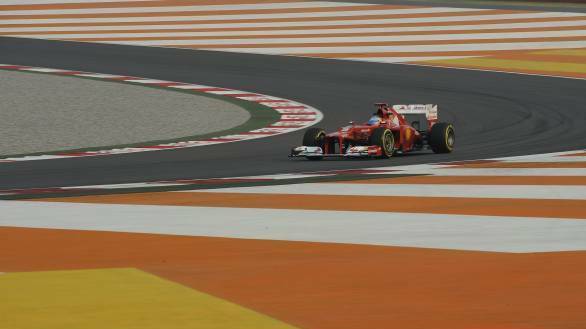 "The idea is to reschedule the race so that it can be held early on in the year in 2015 or 2016," said Chandhok. Of course, representatives of the BIC were also quick to assure everyone that the 2013 edition of the race will go ahead as planned. However, India's three-year stint in playing host to Formula 1 has been anything but easy so far. To begin with, while several other countries have the government supporting race circuits, in India, it took a privateer to come in and build a purpose built Formula 1 circuit. The JPSI group spent a sum of 200 million dollars purely for the construction of the racetrack, while a further 200 million was spent on licence fees in order to host Formula 1. Track maintenance costs approximately Rs 4 crore a year for a circuit that has - in its past two years of existence - only hosted three races: two editions of Formula 1 and the Sidvin Festival of Speed last December. Of course, the circuit has also hosted driving academies and other events over the course of the year, but that's not enough to sustain it financially. While in 2011 the Sameer Gaur, CEO of JPSI, had declared that they were likely to break even within three years, sometime in 2012 he declared that the company was only likely to break even in five years. The financial stresses of hosting a GP could well be one of the reasons that the 2014 edition of the Indian GP is in jeopardy. That being said, it has been reported that both FOM and JPSI are keen to have an Indian GP. JPSI has confirmed that the Indian GP that was initially supposed to happen in 2014, will now not happen as per schedule. What has been confirmed, however, is that the third of the five-race contract that JPSI and the FOM have will be held in 2013, with the fourth and fifth races being held in 2015 and 2016. One of the main reasons for this move could be that the F1 calendar has expanded since 2011, notably with Russia's Sochi International Circuit vying for a spot in 2014. And it's unlikely that teams will want more than 20 races a year, which means that some circuits have been axed. So, while 2013 won't be the last year you can watch a Formula 1 race in India, the wait will be longer for the next edition.